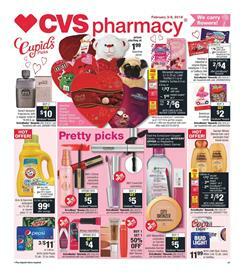 Beauty products and Valentine's Day gifts are two important categories of CVS Weekly Ad Valentine's Day Feb 3 - 9, 2019. ExtraBucks rewards, coupon discounts, cosmetics and more are available in the ad. Explore the new prices of products like Dove Valentine or original promises, Reese's, Sour Patch, M&M's, Lindt Excellence, and more treats on pg 4. Chocolate bars and candy packs are the essentials of a decorative table prepared for Valentine's Day. CVS approaches the shopping for such a day with a romantic understanding so that it also drops the prices of many household products such as Glade air freshener, Tide PODS, CVS batteries, Pet products etc. Visit pg 5 for the special deal on Tide PODS with mfr's $1 off coupon. Also, Downy, Bounce products are on sale. Beauty products will be cheaper at CVS. You may save $1 for Girls Inc. with buying the products specified on pg 6. Olay Mists, Masks, and Regenerist are participating products to that deal. Moreover, you will find ExtraBucks rewards on Physicians formula, Ardell false eyelashes, Rimmel cosmetics and so on. Moisturizing creams are the best things when it comes to skin care. Eucerin, Aquaphor and more products. These are a particularly vital part of personal care in winters. The climate hits -40 in most places in the USA.